I recommend mixing up the dressing ingredients on the side and then adding the dressing a little at a time because this recipe makes a ton of dressing, even bearing in mind that cabbages vary in size quite a lot. Nice flavors but there was so much cumin and mint that the salad had a powdery mouth feel, I would reduce the cumin, not the mint. It was a little overpowering. When I read this recipe it seemed clear and straight forward, but making it I felt it lacked detail. First of all, it calls for an excessive amount of yeast. (Two 7 gram packets.) I halved it and still found my dough rose to doubled within 40 minutes. However, she didn't actually say how large the dough should be when the rise is complete, so I had to assume it was good enough. She says to make the dough balls golf ball sized and stick them in a bundt pan, but that would require layering them and would be essentially monkey bread-was I supposed to do that? Not clear in the instructions so I made them larger as they look in her pick and stuck them in a 9*13. Called for more cheese than I could fit in the bread (dough was very soft and would tear with so much cheese) and more zaatar than you could reasonably blend with the amount of olive oil you are supposed to blend it with. Aaargh! Final product tasted good but was too oily. - Used chicken instead of poussins as much easier to find. - Cooking instructions are poor e.g. does not specify if the freekeh should be cooked, not does it give the cooking time for the chicken which was given as an option. - Washed freekeh very well, then added to chicken stock. Left it to boil for 1 min then simmered for 25min - Cooked chicken for 10min, then stuffed it with the cooked freekeh, cooked for 30min in oven then removed foil and cooked for a final 15 for skin to crisp up. This was a very tasty dish and the stuffing is delicious and would certainly make again. 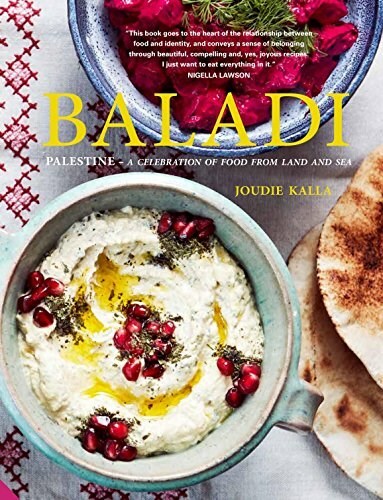 Following on from her bestselling Palestine on a Plate, Joudie Kalla introduces readers to even more of the Middle East’s best-kept secret – Palestinian cuisine.